The Bay Area’s regional bike-share pilot program will now launch no earlier than August and may be phased in over a two-month period. A photo simulation of a bike-share station from the SFMTA. The launch was pushed back one month from its previously proposed date “to give prospective vendors more time to develop thorough proposals and more time to prepare for the system’s launch,” said SFMTA spokesperson Paul Rose. According to a document [PDF] from the Bay Area Air Quality Management District (BAAQMD), the lead agency for the program, the submission period for proposals from prospective bike-share vendors was extended until today following numerous requests. The launch, originally scheduled for spring, may be rolled out in stages throughout August and September, depending on which vendor is chosen, the document says. 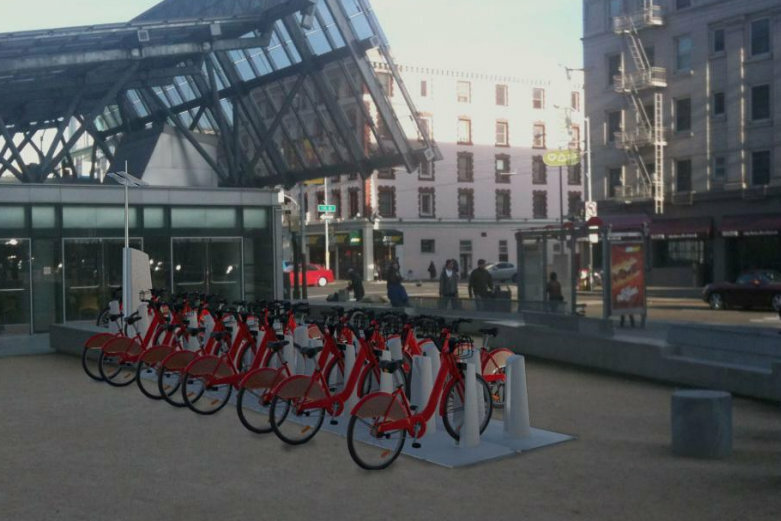 While August 1 is the new “desired start date,” October 1 is the deadline for the vendor to complete the rollout of 100 bike-share stations planned for the pilot — 50 of which will be in downtown San Francisco. Questions submitted to the BAAQMD, listed in the document along with the agency’s responses, include several complaints from vendors that a July 1 launch would be unrealistic. “Unless a preferred vendor has already been chosen and has begun manufacturing, it is not possible for any vendor to manufacture, deliver, test, and deploy the equipment required to support 100 stations, 1,000 bikes, and 1,500 to 2,000 locking docks over five cities, spread out over the 50 miles between San Francisco and San Jose, in the ten weeks from contract award to launch,” writes Richard Layman of BicyclePASS, in a preface to an extension request. A promise of a quick and cost-effective installation is one of the many criteria by which the BAAQMD and transit agencies will select a vendor. Other factors include the sustainability of the vendor’s price structure, the vendor’s experience launching other bike-share systems, the durability and design of its bikes and stations, and how well the vendor adheres to technical and legal requirements. The other companies that submitted questions addressed by the BAAQMD were Alameda Bicycle, Blazing Saddles, Serco, Library Bikes, and ParkWide, which launched a park-to-park bike rental system in San Francisco in October. Following today’s submission deadline, the agencies plan to announce a chosen vendor in May. Find more details about Request for Proposals criteria on the BAAQMD web site. The Bay Area has wasted a perfect opportunity for an early start. The later it starts, the later the required expansion will occur. Which means it will not occur before America’s Cup. Even many other US cities are far ahead, which is a shame. I was thinking that too. Plus, you want to get it out as early as possible when the winter rains end so that people have the whole dry season to get used to it. If you only roll it out a few months before the rains start, it makes it much harder to catch on (I’m assuming it will be much less popular in the rainy season). Well, it’s too bad, but if it can’t be done it can’t be done. At least October is still a fairly nice time to bike. Just let’s not have any more delays.